Today I want to talk a little bit about workshops, how it relates to being an artist and what it means in the context of my PhD. Being a practicing artist is not a straightforward career. In the pursuit of making a living wage, artists often turn their hand to working in the community, delivering lessons and support to many different groups. As Janie Nicoll comments on the article ‘Artists forced to survive on £100 a week’ in The Scotsman: ‘Being an artist is not a hobby, it is a full time job. I am a freelance self-employed visual artist i.e. a sole trader, and like anyone who is self employed I live from hand to mouth without a salary, security, stability or a pension to look forward to. I juggle short term, part time contracts that I come by often through open selection and interview, and sometimes by invitation. I undertake projects, residencies and commissions and work at my own practice, exhibiting and often creating my own opportunities. I exhibit artworks that have been seen by many thousands of people (for free) in this country and abroad, some are contained in public collections, some in private. Like many artists it is rare for me to receive an exhibition fee for the display of my work. I also contribute directly to society, through socially engaged or participatory projects with many different sectors of the population, and I have made artworks for schools, hospitals, libraries, public spaces, in collaboration with school children, the elderly, the disabled, people with mental health issues, and addictions. This statement could have been made by almost any of the practicing artists I know (myself included), but without opening the political Pandora’s box about why we should invest in the arts, this type of background is precisely the reason that I came to be delivering a tunnel book workshop on 15th December at the Stanley and Audrey Burton Gallery in Leeds. The Stanley and Audrey Burton Gallery, situated in the Parkinson Building on the University of Leeds, houses a collection of works from the 17th Century to the present day. Alongside this, it also organises regular temporary exhibitions, as part of its gallery programme. The programme enables people to have access to new works and opportunities to meet the makers, as well as working with different artists to create their own artwork in response to the exhibitions. My tunnel book workshop was one such opportunity in response to the Christopher P Wood exhibition. I enjoy running workshops as I can pass on the knowledge that I’ve learned. However, my favourite part of the workshops, has to be the conversations and observations that come out of them. Focusing on an artwork for the duration of the session and developing their own version of it, seems to create more meaningful connection with the participants, a key factor in assessing research. People don’t just go away with an object they have made but also new ideas, a deeper understanding of the exhibition and the creative skills to produce future work. Through engaging with audiences in this way and encouraging them to develop confidence in their own opinions, the impact and reach of artwork, research and ideas in general, can spread much further. This is definitely an element that I will be looking to apply to my own creative practice. Teaching is over for this year and campus is noticably quieter. I’m feeling the pressure to shut down for the winter, but luckily I booked on a couple of training courses this week, giving me the motivation to keep going. The courses in question were ‘Working with research articles’ and ‘Summarising your research for an audience’. The first of these aimed to save time finding the necessary information from journals by outlining typical structures within research articles, thereby allowing the reader to determine whether the article is of use without having to read it all first. This also helps with writing articles according to journal specifications. More information on reading and writing research articles can be found here. The session also covered journal ratings, using number of citations as a measure of distinction, and although I’m not entirely convinced about these methods, it seems like a useful starting point. There was information on writing summaries of articles, by translating the information consisely into your own words, as well as adding critiques, to create arguments within the text. After learning how to summarise other peoples writing, it was on to our own. This is something I‘ve always found particularly difficult. When people ask me what the focus of my research is I usually say ‘Artist Books as Ritual Objects’. However, that results in needing to define what an artist book is (not an easy task), as well as what I mean by ritual, and then how these two things fit together within the context of my practice. This means that, while it sounds interesting, it’s difficult for people to really understand what I do. This is also not helped by the fact that I’m still pretty much figuring it out myself. After looking at a couple of examples of research summaries and determining what we understood from them, we applied this to our own topics with the aid of a few simple questions. Simple: What is the core message? Is it compact? Unexpected: What will surprise and interest your audience? Concrete: Do you describe concrete actions or abstract concepts? Credible: Do you describe convincing detail, understandable statistics and powerful examples of previous experience? Emotional: Can people relate to it? How can you make them care? Story: Can you inspire people? Can your story be used as a teaching tool? By working through each of these, I went from talking about my work as artist books and ritual objects, to describing it as looking at the effect of the work of art on the audience. Essentially these are the same thing, but they start from a premise of understanding the purpose of the research, which is more useful for people who may not work in your field. It’s been a while since I’ve been back to Special Collections, but I’d made contact with one of the librarians to discuss access to the artist book collection, and the holiday lull seemed a perfect time to follow that up. Given that Leeds has a growing collection of artist books and concrete poetry publications, it seemed vital to use these as primary research sources, both to make full use of the archive available to me, whilst also promoting the collection to a wider audience. 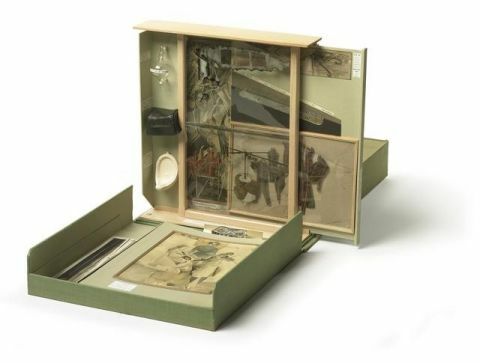 Speaking to the librarian was a fantastic opportunity to find out specific details of the items within the collection and he brought a number of items down to show me, one of which was a copy of Marcel Duchamp’s ‘Box in a Valise’. To say I was a little bit starstruck was an understatement, and I started to understand a little bit more about what the teacher from the ‘Using archives to teach’ lecture (from week 7) was talking about when he described his students reactions to handling Shakespeare’s first folio. The event had been organised by PhD candidates in the Department of the History of Art at Cambridge University. It’s worth noting that most graduate departments support their students in attending and organising conferences, as this is a good indicator of proving that the student is producing publishable work as part of awarding the PhD. To this end, graduate departments also allocate pots of funding to each student to contribute towards travel, accommodation and conference fees. The procedure for applying is pretty straightforward and generally involves stating how the conference is relevant to your research. Although I didn’t know the specific papers that would be presented, the overall theme seemed so fitting to my project, and the fact that it was a presentation by art historians added a new element. The thing I found interesting about talking to the art historians was their seemingly strict adherence to time periods, even choosing to ignore more recent methodologies of interpretation, in favour of the ones that were used at the time of making. On the one hand, it appeared to be a more accurate way of interpreting the meaning of an object, through relating it to the beliefs of its intended audience. However, I wondered if applying new ways of thinking about supposedly universal human traits would open up new avenues of research. In fact, a little more digging around after the conference produced just that evidence in the forms of Bruce Holsinger and Lacan’s Medievalism. Thankfully, as an artist, I’m not bound by such restrictions, and as I wasn’t speaking at the event, I had chance to relax and take in all the amazing presentations. Despite its broad interests, the event was well structured, with papers arranged according to time periods and subject matter. It also managed to create a relaxed and informal ambience, which made me feel more at home, despite the new experience. The keynote speaker was Dr Urszula Szulakowska, who presented a paper on her research into alchemical imagery, particularly in relation to how images of the Virgin Mary had been subverted in order to progress an alchemist agenda. Although the premise seemed somewhat sinister, Szulakowska suggested that, in fact, the reappropriation of religious imagery was not heretical at all, but instead contributed to a new connection between science and religion. The sessions continued in this manner, with strong links to myth making and symbolism through explorations of ritual, sacrifice and fetish. Despite earlier preconceptions about the interpretation methods used by the speakers, I was pleased to hear occasional references to philosophic and psychoanalytic theory such as Jacques Derrida’s Trace, Julia Kristeva’s Abjection and concepts of the ‘Fold’ by Giles Deleuze. I found inspiration for my artwork from almost all of the presentations, but I particularly enjoyed the ones relating to text on objects designed to convey blessings through food, which led to an interesting thought process about eating words. 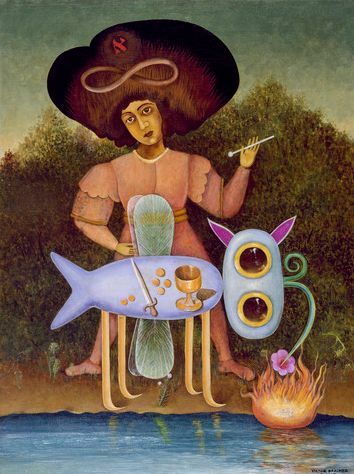 I also enjoyed the Surrealism section, as it provided a more recent example of the way in which artists were reappropriating magical thinking and exploring the relationship between materiality and efficacy in ritual objects. I also had the pleasure of meeting a lot of knowledgable and interesting people, not least of which were a specialist in Surrealist Artist Books based at the University of Cambridge, as well as the founder of The Cambridge Centre for the Study of Western Esotericism. The stack of books I’m reading is slowly piling up as I dip in and out of each of them, so I decided to focus on just one for now, to make some headway into pinning down some evidence for my research. The one I chose this week was Art and Agency by Alfred Gell, which, at least for the moment, seems to be the cornerstone for ideas relating to how the work of art functions. In essence, the idea of agency evokes the work of art as a conduit for social interaction. Specifically, Gell makes reference to the ‘art nexus’, a table of shifting relations between maker, object, idea and viewer. 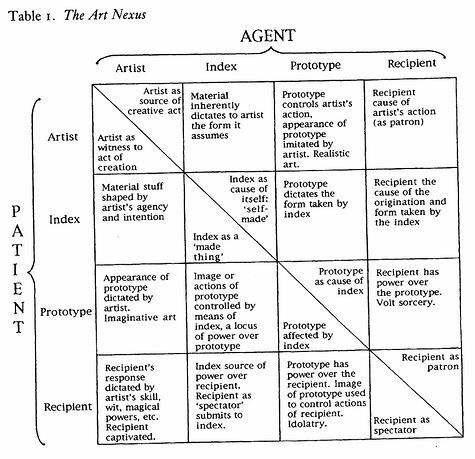 Gell categorises these as artist, index, prototype and recipient respectively, and positions each as agent or patient, depending on whether they are currently acting, or being acted upon. My thoughts at the time of reading, were around the relationship between the index and the prototype, in other words, the art that I’m creating and the thing that it refers to. This was also contextualised by my knowledge and understanding of other artists work, who I believed to be challenging cultural discourse through producing artworks that represented ‘authentic’ voices. However, I found my preconceptions of authenticity troubling. For example, how do we define authentic? If I was to go on holiday, I would want to experience the ‘real’ place I was visiting, but what if that ‘real’ place didn’t match the idea that I had in my head? Would that make it less authentic? I decided to open the idea up to Twitter, who were only too happy to oblige with input into the nature of authenticity in relation to cultural experience. By the end of it I still didn’t really have the answer, but it had created an interesting debate and much food for thought about how I might go about tackling this problem in future. Another element of the agency of the art object is personified in the gift exchange, a factor in many cultural rituals. Lewis Hyde’s The Gift is a seminal work on this topic, and of particular pertinence to discussions I’d been having with artists Debi Holbrook and Jean McEwan. Jean’s own Reciprocity blog aims to investigate this phenomenon in more detail, so we decided to discuss the possibility of organising a barter project, within the context of art practice. An academic aside: Although this project is actually separate to my main research topic, it can be documented and submitted as part of my overall thesis, therefore any exhibitions or projects participated in, can support final outcomes. That said, I do need to be careful about getting distracted from my core premise. Another project I’m involved in, and perhaps the catalyst for my current academic career, is Artist Book Collective. 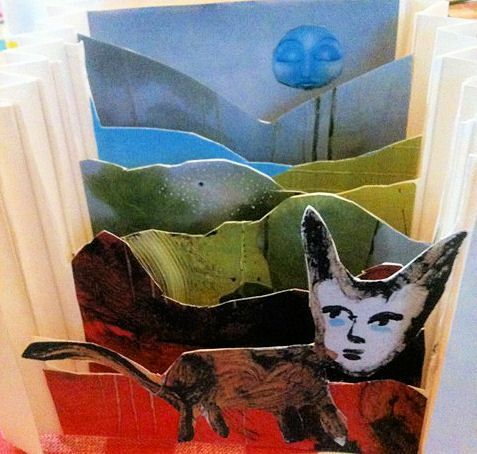 This consists of an international online group of artist book makers, which I created back in 2008 in order to curate real world book art exhibitions. These exhibitions have ranged from mail art collaborations to site-specific installation, and currently, a touring show. It is this show, ‘Bound’ which is now on site in the Bower Ashton Library at the University of West England, courtesy of Sarah Bodman, Senior Research Fellow for Artists’ Books at the Centre for Fine Print Research. This is also the reason that, last Thursday, I hot-footed it down to Bristol, laden down with artworks. Actually, I’ve been meaning to visit Bristol ever since I heard about Sarah’s project through the Book Arts Newsletter which she also edits. When I arrived, I was greeted by Angie, a fellow PhD Student, also researching artist books. She showed me round the library and book collection, and I was really impressed by how accessible the works were for students and the public. 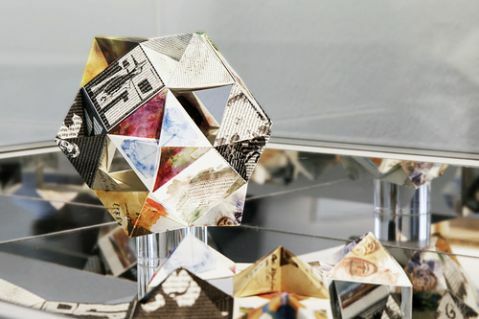 Artist books that had been collected by the University were housed within plastic wallets inside coloured filing cabinets, and looked inviting, while still maintaining the element of organisation. Even books from Sarah’s own collection were available for students to browse, and it gave some new ideas about how I might approach creating an archive of my own.